Each of them is suited for certain skin types and skin concerns. 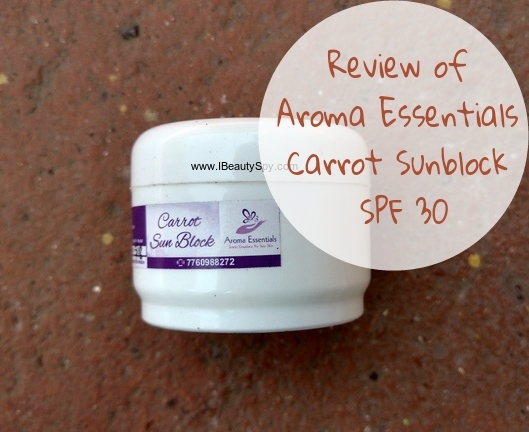 So let’s see what Aroma Essentials Carrot Sunblock does in today’s post. Protects skin from harsh UVA/UVB rays, helps to prevent facial brown spots and skin discolorations, slows down the aging of skin. Rs.205 for 25g and Rs.350 for 45g. Aroma Essentials Carrot Sunblock SPF 30 looks pale yellow in color and has a thick, creamy consistency. It has a herbal kind of smell which I can’t relate to. Maybe its due to the carrot oil, am not sure. Just take a very tiny amount of the cream and dot it all over your face and blend it. I would suggest you to apply some serum or moisturizer before applying, as its kinda difficult to spread on dry skin. It gives a slight cooling sensation on applying which I think is due to the presence of mint. Aroma Essentials Carrot Sunblock SPF 30 takes about a minute to get absorbed and leaves the skin matte. 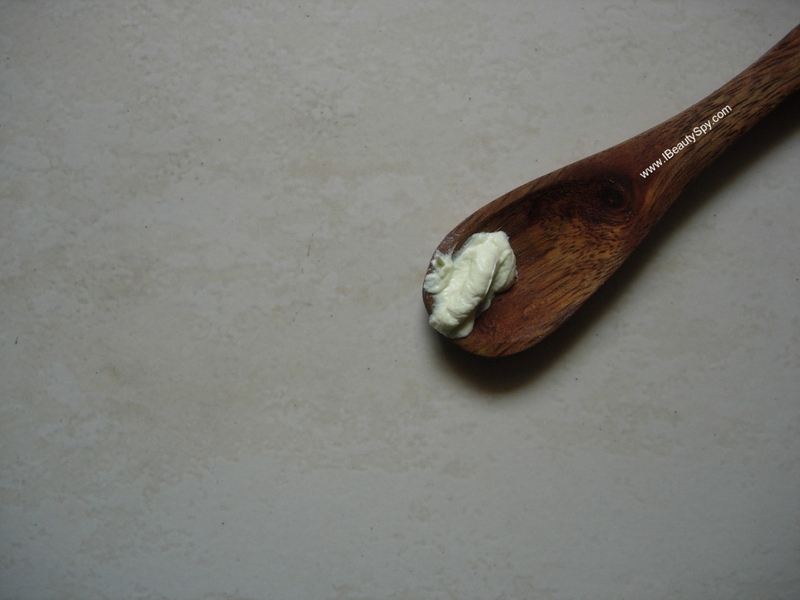 Yes, though its a thick cream, it gets absorbed completely leaving a matte look. The Tomato Sunblock variant had a more dewy finish. Aroma Essentials Carrot Sunblock uses Zinc oxide as the main ingredient. Zinc oxide is one of those few safe sunblock agents which provides both UVA/UVB rays protection. Aroma Essentials Carrot Sunblock SPF 30 does leave a very slight white cast initially. But it fades away in a while (in around half an hour) and then your skin looks fresh and bright. Aroma Essentials Carrot Sunblock is more suitable for combination-normal skin types. Oily skin people might find it to be heavy and dry skin people might need a hydrating moisturizer. It seems to be pricey than the other sunscreens in the market. 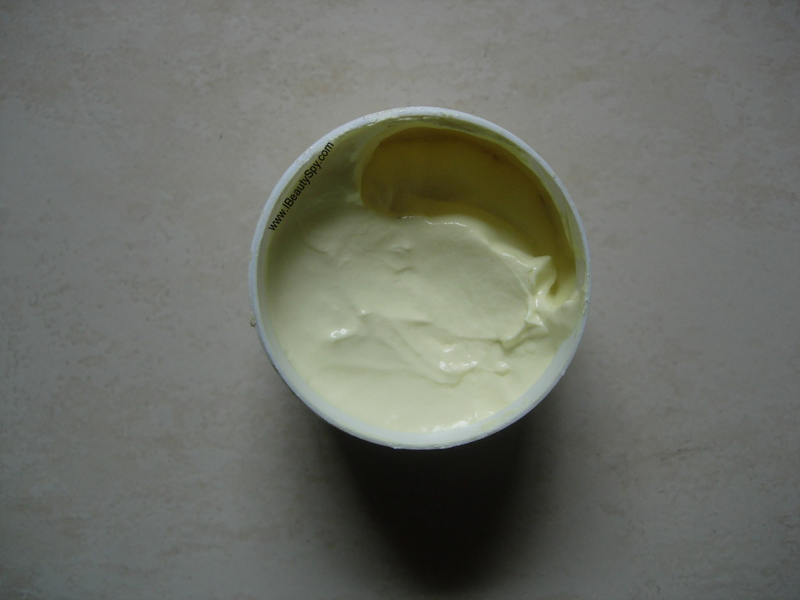 But since its a thick cream, you need very little quantity for one use. Also, I like the fact that this is a physical sunblock and not a chemical sunscreen. Sunblocks form a barrier and prevent the UV rays from reaching your skin. So its suitable even for sensitive skin people. The brand mentions that this is suitable even for rosacea skin condition. Since it protects our skin from the harsh UV rays, it helps to prevent brown spots and skin discolorations as claimed. The presence of carrot oil might slow down the aging of skin too. There are very few natural sunblocks available in the market and among them I would recommend this one. I just wish they had a higher SPF of 50 as for Indian climate I feel, SPF 30 is not enough. If you don’t spend a lot of time outdoors, then this will be a good option. Also, I wish the brand comes up with natural sunscreen lotions to be applied on body. 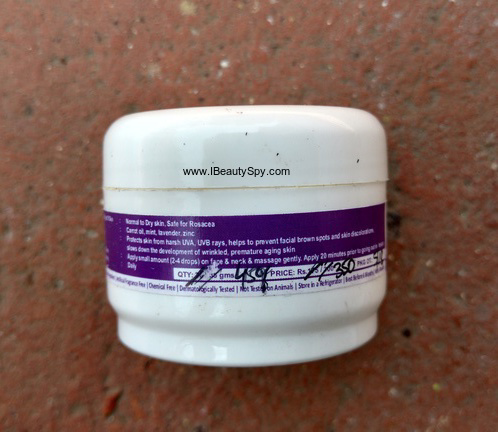 * Has good SPF of 30 and protects from harsh UVA/UVB rays. * Gets absorbed fully and leaves a matte, fresh, bright feeling. * Suitable for combination and normal skin. 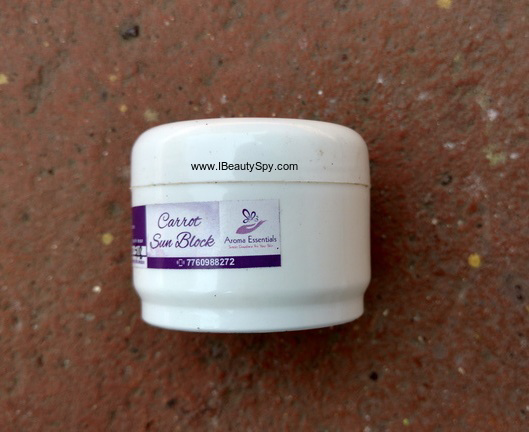 * Contains skin beneficial ingredients like carrot oil, mint and lavender. * Wish it had higher SPF of 50. * Wish they come up with sunscreen lotion for body. Yes, if you are looking for a natural physical sunscreen. Little pricey. Similar to other brands natural sunscreens in the market. Overall, Aroma Essentials Carrot Sunblock SPF 30 is a good option for those looking to try natural, chemical-free sunscreens. Apart from protecting your skin, it also nourishes your skin with carrot, mint and lavender. If you take any normal sunscreen from your nearby store, flip back and look at the ingredients list, you would see a long list of chemicals. Aroma Essentials offers a refreshing difference in the sunscreens market with this clean little beauty! Do try this or any of their other sunscreen variants as per your liking! I absolutely agree with your opinion..:))..the sunscreen is awesome.. I do wish it came with higher SPF. Even still this sounds like a great sunblock to try out. Sounds great for only dry skin. Better than chemical sunscreens.